As much as I love my meat and I really love a hearty stew or a pie, or some other proper British grub, sometimes I just fancy something a bit lighter. I’m a huge fan of throwing a vegetarian meal or two into the weekly meal plan just to break things up a bit. When I go vegetarian I quite often make it a bit of a mezze/tapas style meal with a few different dishes that everyone can help themselves to because it just makes things a little more interesting and, in my opinion, more of an event. 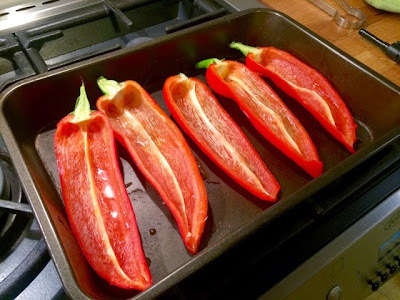 These are a great addition to any mezzo/tapas selection, however I think if you served two halves per person alongside a salad and some rice or cous cous, they’d make a sufficiently substantial main meal. The trick to getting a veggie meal right is packing enough different things in it to bulk it out and keep it chunky and substantial. 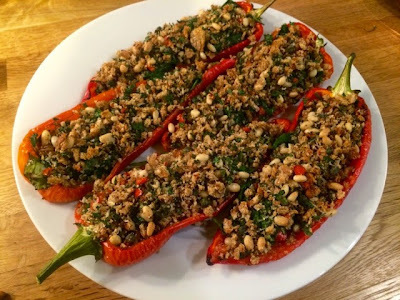 Texture is the key to this dish in particular, with the breadcrumbs and pine nuts providing that extra crunch which makes it more interesting and enjoyable to eat. 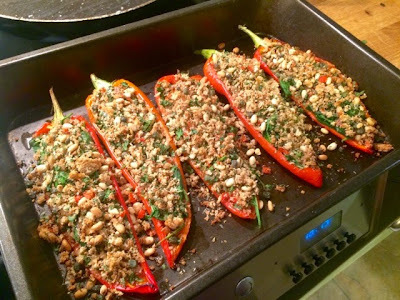 You could adapt this recipe to use bell peppers if you’d rather but I find the Romano peppers have a slightly sweeter flavour, you might also have to make a little extra filling for the bell peppers. Alternatively you could use the same amount of the spinach filling and mix it up with some rice or cous cous. 2. 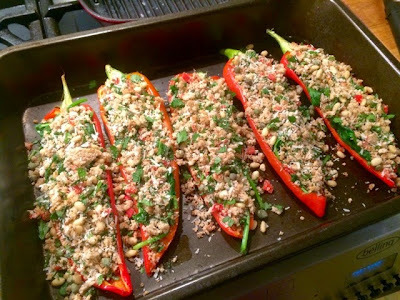 Half the peppers and spread out on a baking tray. Drizzle with oil and season with salt and pepper. Bake for 20 mins. 3. 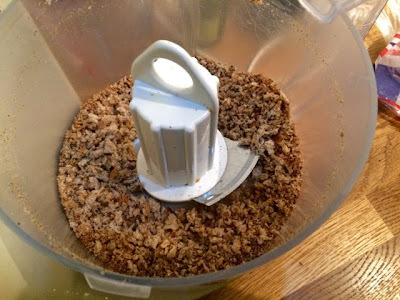 Use a food processor to make breadcrumbs from your slice of toast. 4. 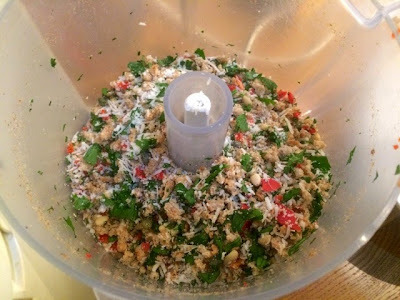 Add the parsley, pine nuts, cheese, and chilli and blitz together thoroughly. 5. 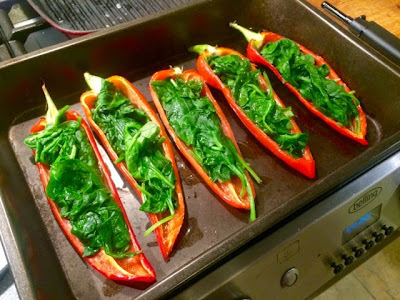 Pull the peppers out of the oven and drain the wilted spinach and, squeezing out as much liquid as possible. 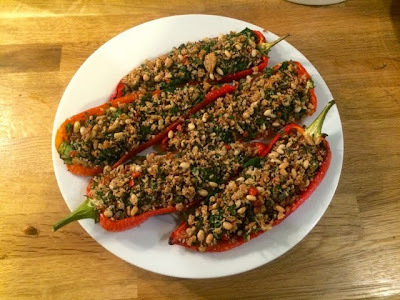 Fill each pepper half with a layer of spinach. 6. 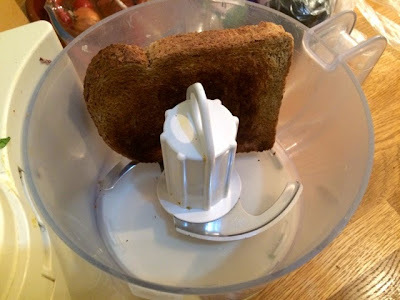 Top this with the mixture from the food processor, dividing equally among each pepper half. Top with a little more grated grana padana. Bake for 15 minutes. 7. The topping should come out looking beautifully crispy and golden. 8. Serve with a side salad, as a side dish to a nice juicy steak or as part of a mixed mezze with falafel, dips, flatbreads and cous cous.